Rainbow Activities for Kids with Family Fun Friday! Is there anything on earth better than a rainbow? They’re scientific marvels, they’re a sign of spring, and they’re just gorgeous to look at! They are all that is right with the world. I love making rainbow crafts and projects with the kids. They brighten up any gloomy day. And springtime is a wonderful time of year to learn about rainbows, no matter how old your kids might be. 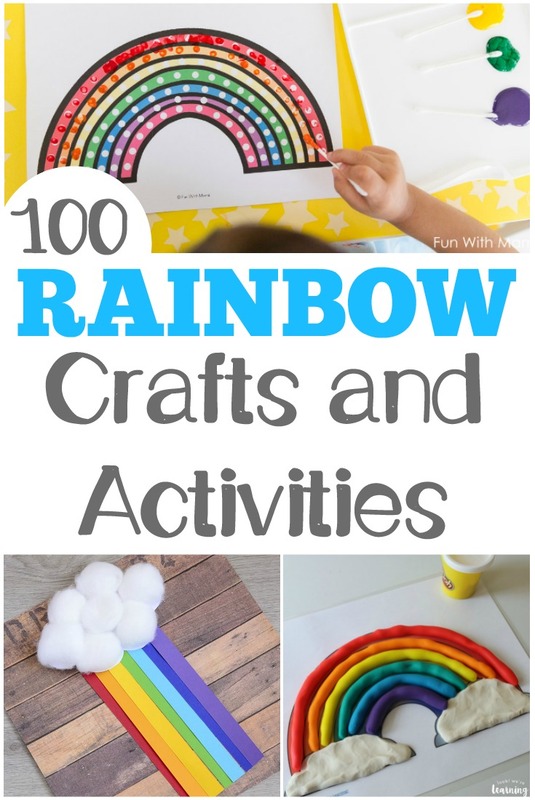 So I thought I’d share a mega list of 100 rainbow activities for kids! There are so many beautiful crafts and activities here, including easy rainbow crafts, yummy rainbow snacks, and even printable rainbow learning activities! Take a look to find some awesome rainbow fun for your little ones! And if you’d like to learn more about how rainbows form with the kids, don’t miss this easy rainbow unit study! 1. Coffee Filter Rainbow Craft – Look! We’re Learning! 17. Rainbow Handprint Art – Crystal and Co.